This topic describes how to identify DOM elements and obtain information about them using selectors. Functions and CSS selector strings that initialize a selector may return a single matching DOM element on the page, multiple elements or nothing. You can use the following Selector properties to check whether matching elements exist and determine the number of matching elements. exists Boolean true if at least one matching element exists. count Number The number of matching elements. Note that selector property getters are asynchronous. Selectors and promises returned by selectors expose API to get the state (size, position, classes, etc.) of the matching element. See DOM Node State. Note that these methods and property getters are asynchronous, so use await to obtain an element's property. If you need to get the entire DOM element state, call the selector with the await keyword like you would do with regular async functions. It returns a DOM Node Snapshot that contains all property values exposed by the selector in a single object. Note that if a selector initializer has several matching DOM nodes on the page, the selector returns the first node from the matching set. It's not recommended to pass DOM Node Snapshot's properties to built-in assertions to check the state of the element. To enable Smart Assertion Query Mechanism pass selector's properties to assertions instead. You can pass selectors to test actions to use the returned element as the action target. DOM element snapshots can also be passed to test actions. In this instance, the selector that was used to fetch this snapshot will be called once again. Before executing an action, TestCafe waits for the target element to appear in the DOM and become visible. If this does not happen within the selector timeout, the test fails. Note that if a selector initializer has multiple matching DOM nodes on the page, the action will be executed only for the first node from the matching set. You can check whether a particular DOM node has the expected state by passing a selector property directly to assertions. In this case, TestCafe enables Smart Assertion Query Mechanism to avoid accidental errors and unstable tests. In this example the developerNameInput.innerText property will not be calculated immediately, but it will wait until the assertion is executed. When a selector is called in test code, TestCafe waits for the target node to appear in the DOM within the selector timeout. You can specify the selector timeout in test code by using the timeout option. To set this timeout when launching tests, pass it to the runner.run method if you use API or specify the selector-timeout option if you run TestCafe from the command line. Within the selector timeout, the selector is executed over and over again, until it returns a DOM node or the timeout exceeds. If TestCafe cannot find the corresponding node in the DOM, the test fails. Note that you can require that the node returned by the selector is visible. To do this, use the visibilityCheck option. TestCafe outputs information about failed selectors to test run reports. When you try to use a selector that does not match any DOM element, the test fails and an error is thrown. The error message indicates which selector has failed. An error can also occur when you call selector's methods in a chain. These methods are applied to the selector one by one. 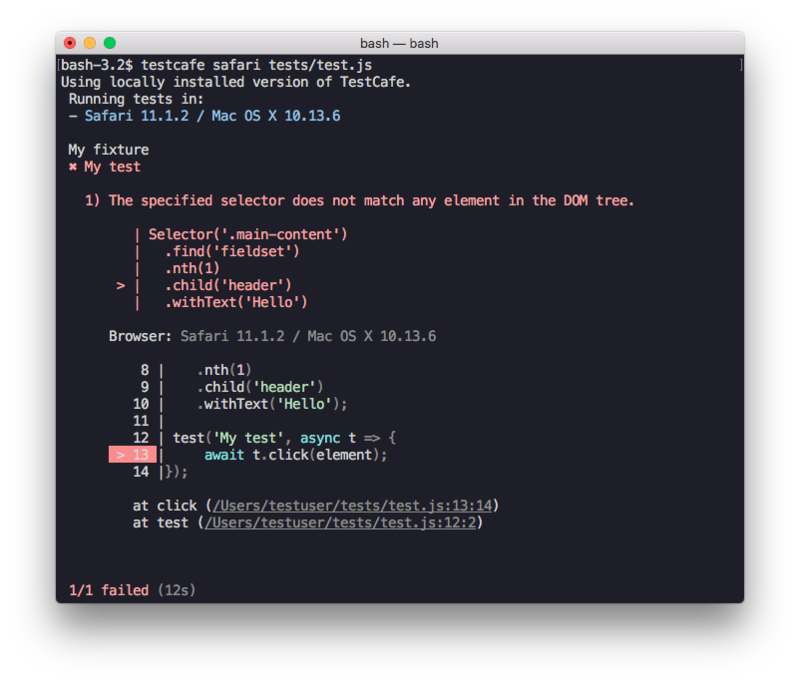 TestCafe detects a method after which the selector no longer matches any DOM element. This method is highlighted in the error message.